Nasdaq’s commercial technology arm, Market Technology, powers mission-critical capital markets infrastructure at more than 100 exchanges, clearinghouses, and central securities depositories across 50 countries. To better serve its global clientele, Nasdaq re-architected its enterprise offerings and released the Nasdaq Financial Framework (NFF) in 2016. The Framework’s modular design leverages a single operational core that powers a vast portfolio of business applications and services across the trading lifecycle, enabling Nasdaq customers to easily add, remove and amend their mission-critical technology stack without the cost and complexity associated with monolithic infrastructure systems. NFF was designed also to take advantage of the benefits of emerging technologies to enable key strategic advantages for customers. “Our [capital markets] industry is evolving faster than ever with the advent and advancement of cloud, blockchain, machine intelligence and others. Key players in the industry are looking to these technologies to explore how they can become more effective and efficient, but also gain competitive advantage,” says Magnus Haglind, Senior Vice President and Head of Product Management for Nasdaq’s market technology business. To accelerate Nasdaq’s blockchain capabilities aligned with the industry’s rising demand, the company is integrating the Nasdaq Financial Framework with Microsoft Azure Blockchain to build a ledger agnostic blockchain capability that supports a multi-ledger strategy. Azure will deliver highly secure interoperation and communication between the Nasdaq Financial Framework core infrastructure, ecosystem middleware and customer technologies, using an innovative blockchain microservices suite to execute transactions and contracts. These offerings create a sophisticated blockchain system that allow various technologies to work together in a secure, scalable way, and enable Nasdaq to meet their customer requirements across multiple projects. These capabilities will also allow capital market organizations to use any NFF-based applications that incorporate blockchain technologies without the need for ledger-specific skills or knowledge, which is critical as the industry pursues new use cases for distributed ledger technology. 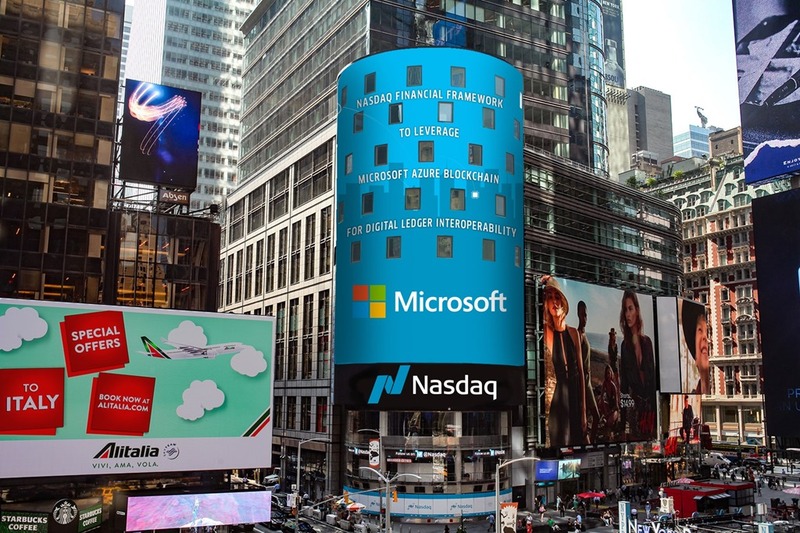 At Microsoft, we are honored to partner with Nasdaq to evolve their innovative market-enabling technology. As the leading enterprise platform company, we are fundamentally committed to the success of our customers. We are excited to work with Nasdaq to apply cloud and blockchain technologies to industry problems that they deeply understand, and enable their continued success.